On Saturday, I decided to try out this idea. What would happen, I wondered, if I stopped trying to get my life to look like the inside of a magazine, if I stopped obsessing about the outsides of things: fluffing the pillows just so, cleaning up the endless parade of Thomas trains, trying to get the golden tan and perfect abs of a swimsuit model? I lasted about two minutes. As soon as I left my bedroom at ten of seven Saturday morning, I tripped on a stack of children’s books and immediately told my son (not even five) that he needed to be a bit more responsible about his things. “It’s OK, I’ll clean it up” my husband said, coming out of the bathroom with toothpaste still on his lip. “Go. To. Yoga,” he mouthed. I sighed. Already I was failing. Only now I was beginning to suffer about the fact that I couldn’t seem to stop suffering. In yoga class, I felt like I had been given someone else’s body. Someone older and remarkably inflexible. I have just started running again and my hips are tight. I could barely manage downward dog and still breathe. What would not suffering look like right now? I asked myself. 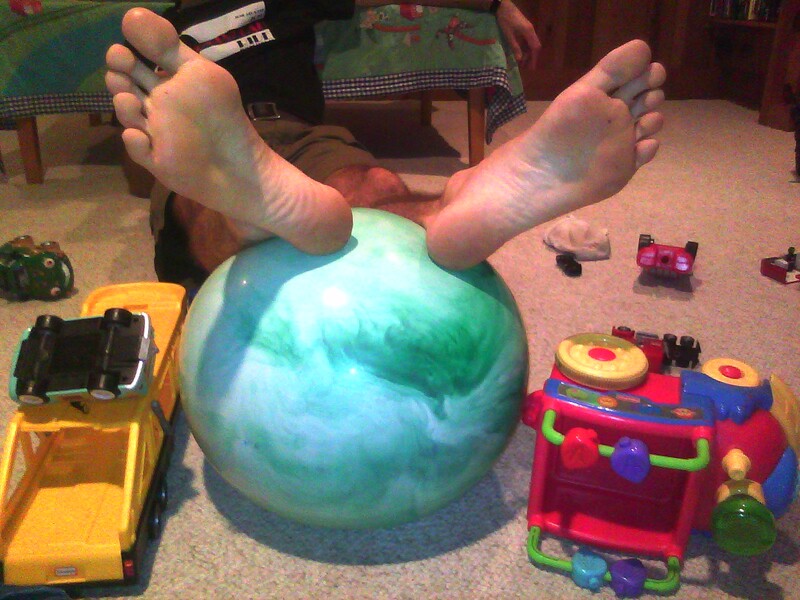 My body answered by sinking into child’s pose, which I rarely ever do. My usual mantra is “Do it right or don’t do it at all.” Hardly conducive to a lack of suffering. “What?” I asked. “I just went to the store.” Then I looked down at my watch and realized I was home almost an hour later than I said I would be. Later, after they left, I found the word “LOWES” in big letters on today’s date on the wipe-off calendar we have in the mudroom. Oh, I thought, he did tell me. And I just made him feel awful. In my desire to end my own suffering, I had somehow passed it on, chucked it into my husband’s lap. Even the silence in the house felt accusatory. Gus, my baby, not yet two, walked in. “Mommy, play,” he said. But I was already gone into the buzz of feeling bad, and on top of that, the pressure to not suffer. You are just not doing it right, I told myself. Also on the calendar under “LOWES” was a reminder about an Octoberfest party I had forgotten about. And I needed to bring something. “Let’s make brownies,” I told my son, and instead of playing, I sat him up on the counter with me as I took brownie mix from the pantry and added melted margarine and water, letting Gus taste the thick batter. I made frosting too, following a rich vegan recipe that made me feel a bit better about myself. After I frosted the brownies, I tried a small spoonful of icing and then another. Pleasure, I thought to myself. I am going to make this day about pleasure. I am going to allow myself all that I usually restrict, all that I typically deny. The spoonful of frosting was followed by another and then more, until half of the bowl was gone. “Mommy, play,” Gus said, wandering into the kitchen again, after the leftover frosting was in the trashcan, safe, where the part of me that can’t be trusted couldn’t get to it. Now, in addition to being miserable, I had a stomachache, a head flying with sugar. I wanted to cry with the failure of it all, with how hard I try, only to come up short. I had just been to a yoga class. Why wasn’t I fixed? I felt like a fraud, like someone who goes to mass and then yells at the car behind then while still in the church parking lot. Somehow I had mistaken a lack of suffering with hedonism, I had confused letting myself off the hook with allowing myself to get out of control. I had thrown self-discipline out the window. I had simply externalized my suffering, handed it off to someone else, and in my pursuit of external pleasure had created a brand new type of pain. I had just gone from one extreme to the next. I had abandoned my northern Puritanical roots for a day on the Las Vegas strip and had completely skipped the middle. Why, I wondered, did moderation feel so extreme? In the same yoga workshop in which Rolf Gates talked about the way we beat ourselves us, he stressed the need for stability. Equinimity. A sense of happiness with ordinary things, with the way life was at that moment. The workshop was held in a large gym, and even though outside, it was a normal, swampy D.C. summer, inside the gym, the air conditioner was on full blast. Those of us in yoga tanks were shivering. “How many of you practice yoga in a warm room?” Rolf asked. All of us raised our hands. “Is this room warm?” he laughed. “But it shouldn’t matter,” he continued. “You show up, you do yoga. It’s hot, it’s cold. It doesn’t matter. You don’t feel like it? It doesn’t matter. You show up. Yoga isn’t what you are doing. It’s how you are being.” I thought of that now. Being yoga. Practicing equinimity. Ignoring the whining voice in my own head the way I sometimes ignored my son’s: “I can’t understand you when you talk like that, sweetie.” A way of only paying attention to my power, to the truth, to the way things were, regardless of how I felt about them. A way to end suffering by simply ignoring it, by waking up to the present moment and just sinking in to whatever it offered. Maybe suffering was optional? When I was moving, my yoga teacher, Jessica Anderson suggested I make a self-care package for myself, something to get me through these days and weeks of change and uncertainly. She herself had a book full of inspirational quotes, photos, poems. She told me about how she paves her weeks on Sunday nights, making sure she had what she needed in the days ahead to be her highest self: time to meditate, healthy food in the fridge, time with her children. A way of caring for the powerful part in her. I, on the other hand, had forgotten the discipline it took to be an adult. To take responsibility. I had mistaken selfishness for self-care. So I wrote down a list of what I need for the week. Green smoothies for breakfast and chocolate-flavored tea. Poems by Mary Oliver and my fleece-lined flip-flops. More vegetables. Time on my mediation cushion and time watching Glee. Talking like Sir Topham Hatt and watching my sons giggle and race Thomas and Gordon around their wooden track. Snuggling with my husband. Simple, simple things. Things that take me out of my head and into that soft, still place behind my heart. Is there anyone among us who hasn’t inflicted suffering on ourselves in this way? But we are not all so honest about it, or so eloquent. You’ve set a tone for my day, and I’m so grateful for your new blogging venture. Grateful too to find Rolf, my own first teacher, quoted here, sounding just so wonderfully Rolf-ish. What a small and intimately connected world this is, when we open our hearts and share our stories with one another. Keep writing! Yours is a voice we need. I am so, so, so glad that Katrina sent me your blog … I feel like I’ve tumbled into a deep well of kindred-ness even just reading a few posts. Rolf was my first and most beloved yoga teacher. Mary Oliver is the person whose words I return to, over and over again (Katrina and Dani Shapiro are on that list too). I love your writing. I can relate to so much of what you say here, on a soul-deep level. Thank you for sharing it. You are currently reading Suffering at Walking on My Hands.